After several years of problems with our old ‘Elevette’, it became apparent that it needed to be closed down and we had to find a way to install a new elevator or lift. 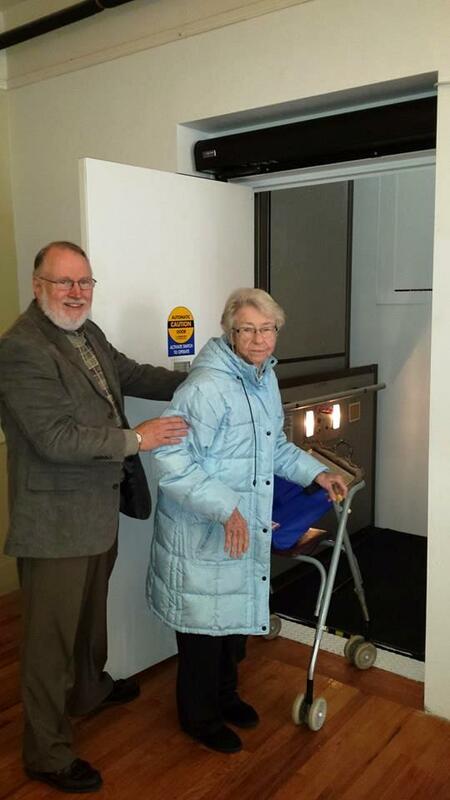 After research and viewing ADA Platform Lifts at several other churches, it was decided that this was the best option for Hope UMC., as the cost was less than half that of an enclosed elevator. In November of 2013 the old ‘Elevette’ was decommissioned and removed. A structural engineer was hired to develop a construction plan for the new lift. State and Local permits for the project were in place by the end of January 2014. The goal was to have the lift ready for use by Easter Sunday, April 20th. View the slide show below to see the project step by step. The lift was completed just in time and we were very grateful to our town inspectors for coming through for us at the last minute so that the lift could be used on Easter Sunday. Project manager and trustee, Duane Stinchfield helps Sonya Hawkins onto the new lift. If you are interested in financial information about the project it can be viewed here, ADA Lift Project Expenses April 30, 2014.